(C) Sir Syed Ahmed Khan. 2. 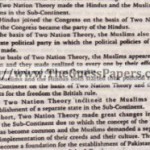 (i) Analyze the significance of the Two Nation theory in the creation of Pakistan. The two-nation theory is the ideology that the primary identity of Muslims on the Indian subcontinent is their religion, rather than their language or ethnicity, and therefore Indian Hindus and Muslims are two distinct nationalities, regardless of ethnic or other commonalities. The two-nation theory was a founding principle of the Pakistan Movement (Le. the ideology of Pakistan as a Muslim nation-state in South Asia), and the partition of India in 1947.The ideology that religion is the determining factor in defining the nationality of Indian Muslims is also a source of inspiration to several Hindu nationalist organizations, with causes as varied as the redefinition of Indian Muslims as non-Indian foreigners in India, the expulsion of all Muslims from India, establishment of a legally Hindu state in India, prohibition of conversions”to Islam, and the promotion of conversions or recon versions of Indian Muslims to Hinduism. (ii) Describe the objectives of Khilafat Movement. The Khilafat movement (1919-1924) was a pan-Islamic, political protest campaign launched by Muslims in British India to influence the British government and to protect the Ottoman Empire during the aftermath of World War i. • To maintain the Turkish Caliphate. • To protect the holy places of the Muslims. • To maintain the unity of the Ottoman Empire. (iv) Write note on Indus Water Treaty. (v) Describe five main Islamic Provisions of the Constitution of A.D. 1973. 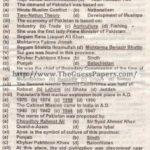 (vi) Illuminate the Geographical importance of Pakistan in South Asia. 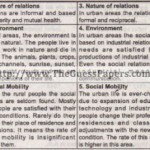 (vii) Describe any five differences between the Rural and Urban society of Pakistan. 1. People living in urban have better living conditions than those living in the rural parts. 2. Rural is very poor when compared to urban. 3. In rural, the parents seldom educate their children, and instead, make their children work in the fields. 4. About three-quarters of the households in urban live in cement homes. On the other hand, only a quarter of the people in rural live in cement homes. 5. Most of the developments have not yet reached the rpra! parts. 6. With regards to health care, rural lacks good hospitals when compared to urban. (viii) Discuss the importance of Agriculture of Pakistan. 3. Narrate the important political events that took place from A.D. 1940 to A.D. 1947 in the creation of Pakistan. 4. Describe the role of Urdu in the National integration of Pakistan. 5. Discuss the importance of the city of Karachi in Pakistan’s Economy. Karachi is the largest city, main seaport and financial centre of Pakistan, as we” as the capital of the province of Sindh. It is Pakistan’s premier centre of banking industry, economic activity and trade and is home to Pakistan’s largest corporations, including those involved in textiles, shipping, automotive industry, entertainment, the arts, fashion, advertising, publishing, software development and medical research. The city is a major hub of higher education in South Asia and the Muslim world. Karachi is the location of the Port of Karachi and Port Bin Qasim, two of the region’s largest and busiest ports. The city is located in the south of the country, along the coastline meeting the Arabian Sea. It is spread over 3,527 km2 (1,362 sq mi) in area. Karachi is the financial and commercial capital of Pakistan. In line with its status as a major port and the country’s largest metropolis, it accounts for a lion’s share of Pakistan’s revenue. According to the Federal Board of Revenue’s 2006-2007 year book, tax and customs un1ts in Karachi were responsible for 46.75% of direct taxes, 33.65% of federal excise tax, and 23.38% of domestic sales tax. ‘Karachi accounts for 75.14% of customs duty and 79% of sales tax on imports. Therefore, Karachi collects a significant 53.38%of the total collections of the Federal Board of Revenue, out of which 53.33%are customs duty and sales tax on imports. Karachi’s contribution to Pakistan’s manufacturing sector amounts to approximately 30 percent. A substantial part of Sindh’s gross domestic product (GDP) is attributed to Karachi (the GDP of Sindh as a percentage of Pakistan’s total GDP has traditionally hovered around 28%-30%; for more information, see economy of Sindh). Karachi’s GDP is around 20% of the total GDP of Pakistan. A Price water house Coopers study released in 2009, which surveyed the 2008 GDP of the top cities in the world, calculated Karachi’s GDP (PPP) to be $78 billion(projected to be $193 billion in 2025 at a growth rate of 5.5%).It confirmed Karachi’s status as Pakistan’s largest economy, well ahead of the next two biggest cities Lahore and Faisalabad. The World Bank identified Karachi as the most business-friendly city in Pakistan. 6. Explain the Foreign Policy of Pakistan.